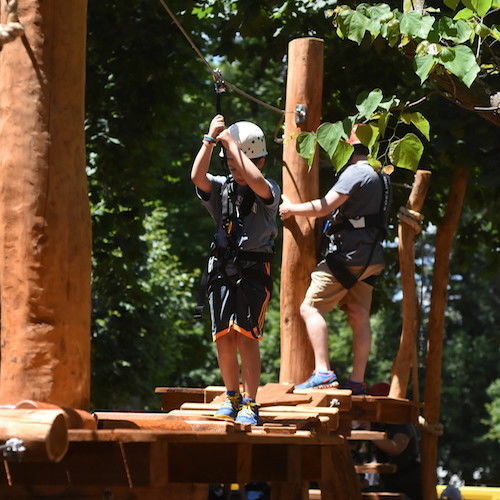 Jump, soar, climb, and leap at Elmwood’s state of the art Adventure Park & Sky Park. This area includes a low ropes course, zip line, climbing wall, and jump platform. Campers are harnessed in on our Koala Continuous Belay System. On the upper level, campers can visit Sky Park: Elmwood’s very own collection of hanging bridges, giant squirrel’s nest, and pirate ship. These activities thrill our campers while also helping them become more resilient and better able to adapt to changing situations. These activities are supervised by members of our Adventure Team who help our campers set goals for themselves and help children achieve what they never thought was possible!